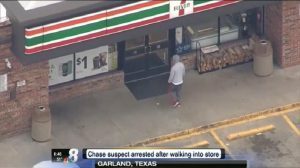 A police car chase in Texas has ended with the suspect’s arrest after he took a stop off at a 7-Eleven convenience store. The driver was being chased for about an hour, after fleeing a traffic stop before the police called off the chase. Despite police on the ground halting the search, helicopters continued to follow the suspect. It was then that he was spotted entering the convenience store, where the police were able to apprehend him upon his exit. He charged with evading arrest and several traffic warrants.